Who Can Sue to Evict a Tenant? This questio­­n always seems to confuse landlords, tenants and the attorneys for tenants who are intent on delaying the eviction process. Under California Law only the real property in interest can sue on a claim, including a claim to evict a tenant. California Law defines the “real party in interest” as the person who owns or holds title to the claim or property. In the context of an Unlawful Detainer case that means that only the owner/lessor of the rental property can be named as a Plaintiff in an eviction case. Thus, the landlord owner’s agent does not have inherent authority to sue in the agent’s own name as “real party in interest.” (CC § 2322; Modlin v. Walter’s Fur Shop (1948) 83 CA2d 384, 390, 188 P2d 805, 808-809). However, this is a general rule only with several important exceptions. There is no case on point holding that a landlord can assign his or her interest in an Unlawful Detainer action to an agent and only general law permitting the assignment of claims. Thus, landlords should consider that, subject to exceptions specified in CCP §§ 1161 and 1161a, the sine qua non to maintenance of an Unlawful Detainer action is the existence of a landlord-tenant relationship. [See Cavanaugh v. High (1960) 182 CA2d 714, 716, 6 CR 525, 526]. Landlords use this exception carefully. Exception 2 Even though technically not the “real party in interest,” an agent would have standing to sue if the lease or rental agreement was entered into in the agent’s name. By authorizing the agent to enter into the lease, the landlord essentially assigns the interest in the property prior to the creation of the landlord-tenant relationship. Exception 3 The landlord’s agent might have standing to file a Unlawful Detainer if the landlord gave the agent written authority to sue and retake possession in the agent’s own name. [See CC §§ 2304, 2322]. This authority could be provided in a general power of attorney. However, there is no known authority so holding; absent assignment of the principal’s interest in the property or allegation the agent is a party to the contract, suit in the agent’s name alone is likely to draw a general demurrer unless the assignment is properly set forth in the lawsuit. Exception 4 Landlord owners frequently confer management responsibility on a property management firm, and enter into a written agreement authorizing the firm to execute leases, collect rents, and recover possession from defaulting tenants. In order to properly plead a cause of action for Unlawful Detainer filed by a Property Management Firm: (1) Its status – Individual, partnership, corporation, etc. ; see item “2” on Judicial Council form complaint; (2) That it is a party to the lease or rental agreement or assignee of the principal’s interest; (3) If suing as a party to the lease or rental agreement, that it executed the lease/rental agreement in its own name for the principal’s benefit pursuant to a management agreement with the principal, detailing the authority conferred. Many tenants and/or their attorneys attempt to make the argument that Property Management Firms cannot be named as a Plaintiff in an Unlawful Detainer case. That is simply untrue under California Law and is an attempt to misguide the court. 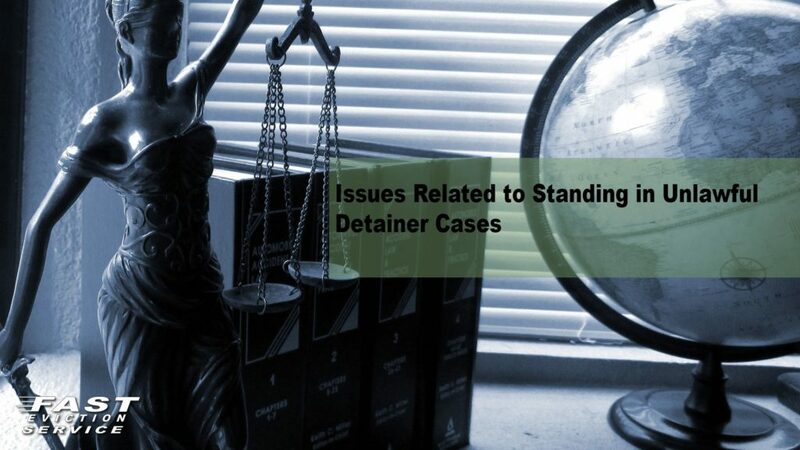 The above rules and exception regarding standing in Unlawful Detainer cases are set forth for general information only. Standing in every legal action must always be evaluated on the specific facts of the individual case.